Sorry for my long absence. . .busy and all that. Plus my computer hates me and is half-broken. It takes much longer to post in-between phone calls at work then it does when I can do it at home during nap-time. So lemme see. . .where were we? Christmas? Yes! It happened! We didn’t do nearly as much crafty-wise as I’d have liked to celebrate this holiday. Boo! I had loads of projects that I was very excited to do with T. But there will be other years, yes? I had too many of my own projects to get done in time, plus the whole exhausted/pregnant thing. . . Still we managed to pull off a few, aside from all the ornaments I posted about already. We did a lot of very simple projects like this one. It’s amazing the fun you can have with just a little bit of construction paper, glitter, beads, and foam stickers from the dollar store! 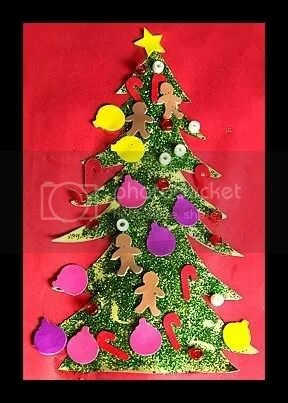 We also made salt-dough ornaments! Naturally Puff needed quite a bit of help with these, but we both had a great time. Ours looked kind of funny, cuz’ I only had whole-wheat flour, so they were tan and had a bit of texture to them. But they turned out just fine! Our poor ginger bread men. . .T doesn’t realize it, but they really look like they got shot in the head. . .there must be a better place to put the hole for the ribbon. . . and T’s poor control over the bright red paint didn’t help them out much! The one that is laying down in this picture was by far the worst. He’s hysterical! 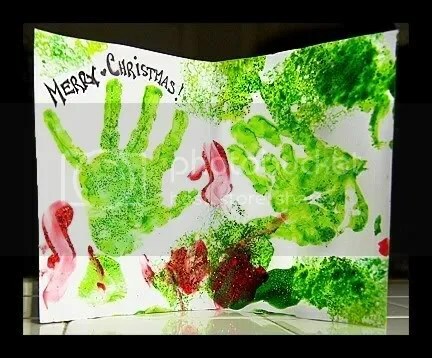 We also made our own Christmas cards! THIS was a ‘super cool’ project, to use Puff’s own words. They turned out brilliantly, and aside from the prep work, T was able to do nearly the entire thing by herself – she’s gotten SO much better at this kind of thing since we made our Mother’s day cards! She was VERY proud of these. . .
First we raided a ‘make your own card’ set that my Zia C had passed down to us over a year ago (thanks ZC!). I could have cut/folded my own poster-board, but considering my problems with the whole cutting a straight line thing, it would have been a disaster. T painted the insides of our soon-to-be cards. One day we did red, and another day we did green (so the colors wouldn’t muddy). We used copious amounts of glitter, naturally. After all of that was done and dry, I cut some green felt into triangles of varying sizes. It was originally supposed to have been 3 per card, but again with the cutting and straight lines – we ended up with 4. 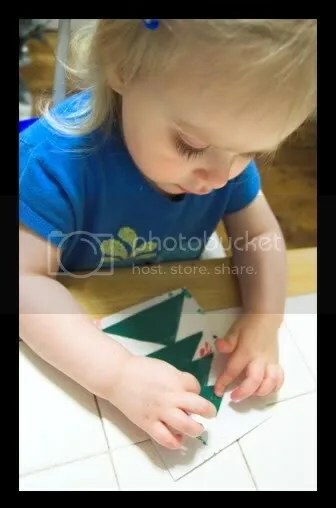 Of course we turned this into a learning activity in which Puff had to pick out the correct size for the next triangle – big, medium, small, and tiny. 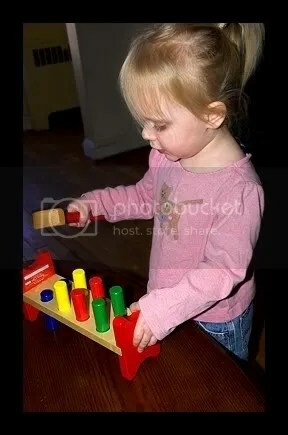 She also had to align them properly, with the correct point on top. SHE DID WONDERFULLY! I was very proud of her perception of the varying sizes and shapes. 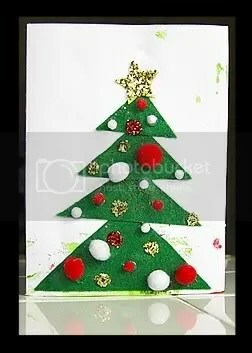 . .
After the ‘tree’ was put together, she topped it with a foam star – which she then covered in golden glitter, of course! We filled in the spaces between pom-poms with glitter when everything else dried, left them all to sit under a stack of books for a week or so, and TA DA! 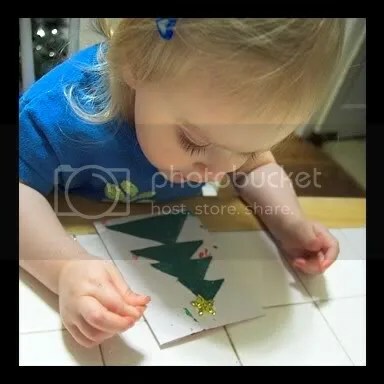 Christmas cards! A picture of the outside. . .
A picture of the inside: Isn’t it great!? Looks like Christmas barfed all over it! Of course every one that she made is unique, which made them even more fun, I think. The card pictured above is the one that I saved. I chose this one specifically because of the perfect hand-prints inside, It will go in her baby book, so she can (hopefully) enjoy it when she gets older. As for the projects that I was working on. . . well, we decided that Christmas this year was all about the Puff. 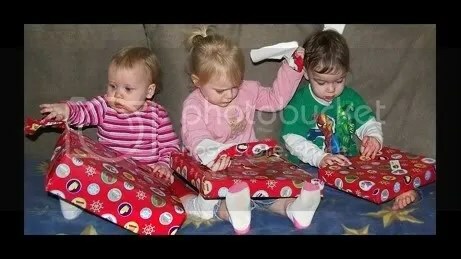 As I mentioned in another post, we haven’t been able to give any Christmas gifts for a while. Though we’re doing somewhat better financially this year (thank God! 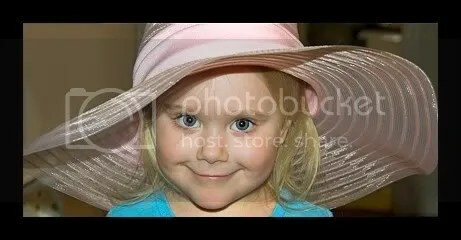 ), we are also expecting a new baby and are the proud owners of a toddler. Christmas will never be what it was back in our single days, but I still really wanted to give to those closest to our little family – without spending a fortune! Time is something that I was willing and able to give (though I have none of that to speak of! 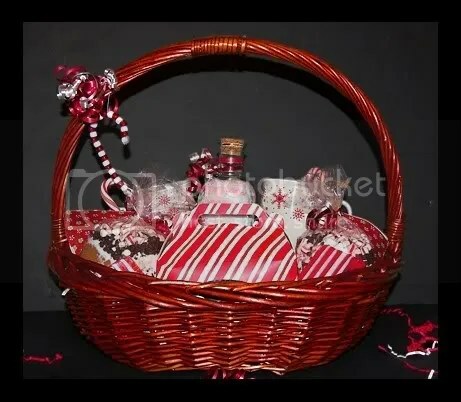 ), and so I came up with the idea to make a candy-cane themed basket. 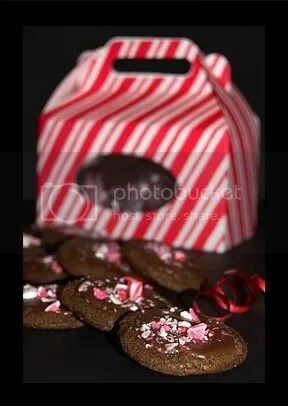 . .
Mint chocolate candy-cane cookies! These were a HIT! They taste very similar to girl-scout cookies, only not so crispy. Yum! 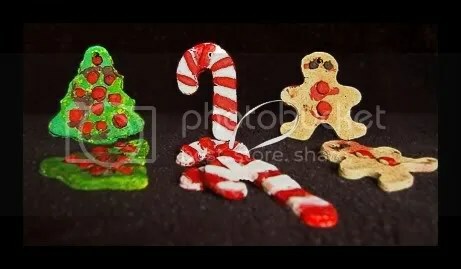 I loved these – nothing says Christmas like candy-canes, but they definitely are not a standard Christmas cookie. . . though I think they should be! Candy-cane hot cocoa! Mmmmmmm! Mix with water, stir with a cane, and enjoy! 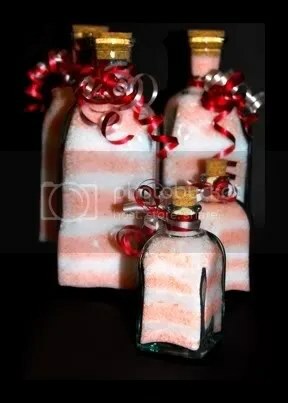 Candy-cane bath salts! These were so easy to make, and aren’t they just adorable?! I dyed them to match, and scented them with some of my peppermint essential oil. Everyone can use a good soak after the holidays. . . 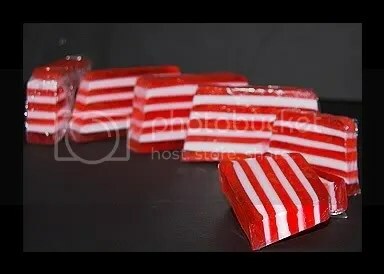 Speaking of baths. . .I also made some candy-cane striped (and scented) glycerin soap to complete the package! 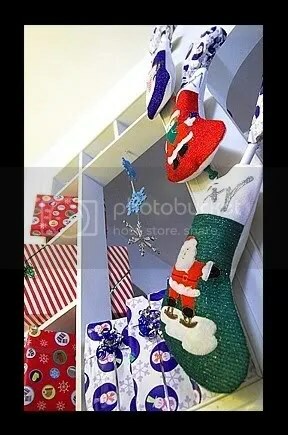 Then I shoved everything into a basket with some red-and-white dollar store mugs (we ended up with 3 designs), candy-canes, and a beaded candy-cane pipe-cleaner ornament made by Puff. . . TA DA! All of the baskets were different, but the image above gives a basic idea! I put a lot of work into making all of this stuff, and I was really proud of the baskets. I was even told that the finished product looked store-bought (which was super-sweet of my cousin to say, even if I don’t believe him!) I hope everyone that got one enjoyed it. It is a holiday! Or at least is SHOULD be!!! On Wednesday the 23rd, Christmas Eve Eve, I hosted a party in my house for all the little people who populate my world. 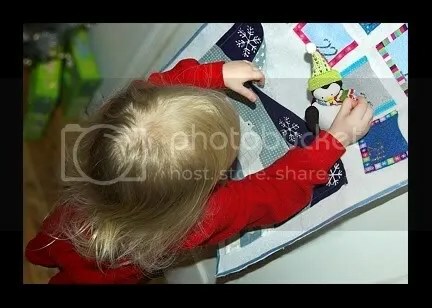 That is my daughter and my day-babies, A and N. I got them all presents (hammer n’ peg blocks – perfect! ), and stockings stuffed to overflowing with dollar-store goodies and candy (including individually wrapped hobby horses, Christmas mini-books, whistle recorders, stuffed polar bears. . . the list went on!). I made red-and-green sprinkled mini-cupcakes, and red-and-green jello. We ordered pizza, and Baby A’s mom brought devilled eggs and made Chex mix (and donated cake mix and icing, too! *luffs*) A wonderful time was had by all! Both Baby N and Baby A’s moms brought presents, too – so there was no shortage of gifts for the little ones to tear into. . .
there was an awful lot of this. . . Here they are, ladies and gents, the Tiny Trio Recorder Band! T workin' those pegs. . .
A wonderful time was had by all . . . a very NOISY and SUGAR-FILLED wonderful time! I was exhausted by the end of the day, but it was totally worth it. They all had so much fun, and I love makin’ my babies toddlers smile! Christmas Eve, was also a fun-filled day. We got visits from a couplea crazy aunts, and of course the Puffy Wonder got to open some more presents! I don’t have too many pics of this day, but T had a wonderful kick-start to Christmas! 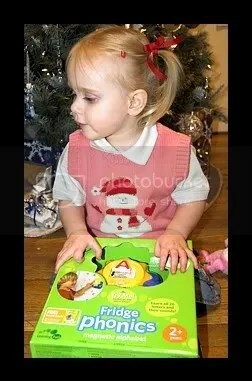 Her Aunt Ki got her BOTH the Fridge Phonics and the Word Whammer by Leap Frog. Google them – they’re RIGHT up her alley! She’s been having a blast with them. Aunt Ki also got her an uber cool blue dragon, which was awesome. And she got a rockin’ hoodie from her Aunt H! I'm tellin' ya - this thing is awesome! Then I let her open up 2 of her presents – both Care Bears. have I mentioned that my daughter looooooves the Care Bears? Puff was a very happy little girl – all these goodies! And it wasn’t even CHRISTMAS yet! I was also a very happy girl. 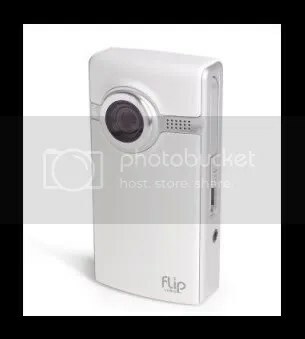 . . because I got MY present on Christmas Eve, too – from my DH and my sissa. . .
First things first, the last pocket in our Advent calendar. . .it was kind of difficult to pick a tiny little prize for this day that could hold its own against all the Christmas goodies that she was about to get, but when I saw this little penguin all dressed up for a snowy day, I knew that I had hit on the perfect thing. I was right – she loves it! 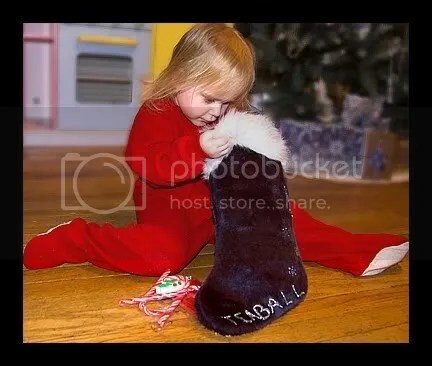 Next came the stocking. . .
and from there, the tree! I’m glad to say that everything that we picked out for Super Puff was a hit. She loved it all – ESPECIALLY her brand new wooden kitchen set. That has been the coolest thing ever since the moment she laid eyes on it on Christmas morning! Daddy likes her kitchen set, too. If only I could get him to cook me dinner in the REAL kitchen. 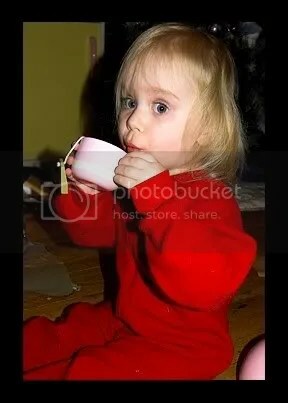 . .
And the tea set? Oh yeah. She loved it. 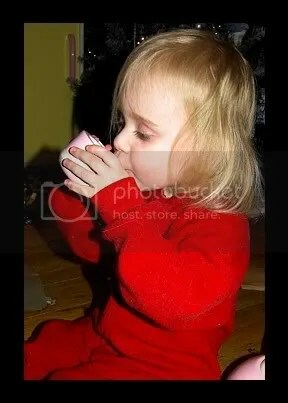 Christmas morning came grinding to a halt so she could ‘make,’ and ‘drink,’ a cup of tea. . .
She liked all the stuff that went with the kitchen, especially the sweet stuff. Cookies, cupcakes, and ice-cream are her favorites to serve. I’ve prolly gained 10 pounds ‘eating’ wooden goodies! 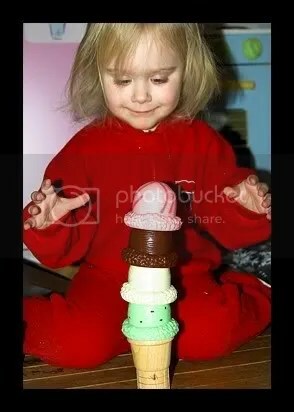 Puff builds a four-scoop ice-cream extravaganza! Then we headed off to Gammy’s house for Christmas breakfast – but there were so many presents to open, it turned into Christmas lunch, instead! Nearly all the pics I took while we were there look very similar to the one above, so I’ll leave it at that. But the girl was spoiled rotten, and got loads of fun stuff for her kitchen set, like the awesome wooden toaster, the cookie-baking set (including mixer and dough-roller), and the smoothie blender, as well as a myriad of other fun stuff – including puppets and a giant box of arts n’ craft supplies *HOORAY*! Gammy was also responsible for actually purchasing the kitchen set that T’s daddy and I picked out for her, and shipping it to our house (in October) so that we could have it ready and assembled to greet Super Puff on Christmas morning. Oh yeah, and she also got us Husby a Wii! Talk about spoiled! I know of one family that is! After nap, it was over to visit my side of the family for Christmas dinner. Of course, we all know that it wasn’t dinner that Puff was looking forward to! She was pumped for more presents, and lemme tell you – she got ’em! This box had Lego Duplos from Puff's uncle. She loves her some 'Weggo's!" Do you know what was IN this amazing box of stuff? YES! BOOKS! Many, many, many books!!! And they all are ‘BIG GIRL BOOKS, with paper-pages! T’s Nonna hooked her up with an entire set of early reader books, and we’re just too thrilled about it. Most of them are Dr. Suess, but there are many other classics, like Madeline, mixed in. 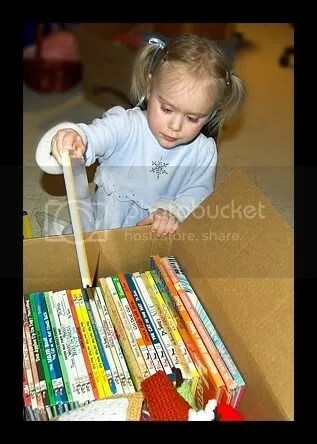 There were so many books that nearly all Puff’s old ‘baby’ board books had to be cleared off her bookshelf to make room for the new additions. Teaball is thrilled with all of her new stories, and so far, I think “Go, Dog, Go” is her favorite, although she really likes “The Cat in the Hat,” too. . .
. . .and do you know what she did with this book? 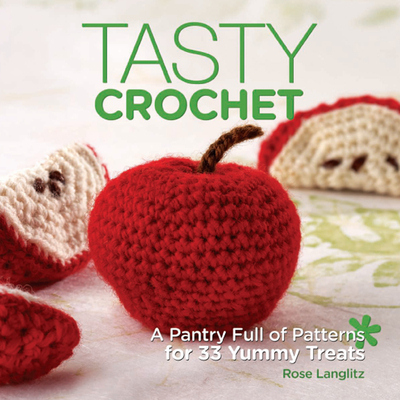 She crocheted a veritable smorgasbord of yummy and tasty treats to populate the little lady’s brand-new kitchen set! Everything from ice-cream to pie to Pop-tarts and hamburgers with all the fixins’ (check out the pic of Puff’s dad above). We have eggs and bacon and bagels with jelly OR cream cheese. Apples and pears and strawberries and carrots. Even a peanut-butter-and-jelly sandwich on wheat! The list goes on – and she’s still making more! This stuff is so adorable. . .
And as if ALL THAT wasn’t enough to make any tiny tot’s year, Zia C and fam put together an awesome dress-up chest for the Puff! 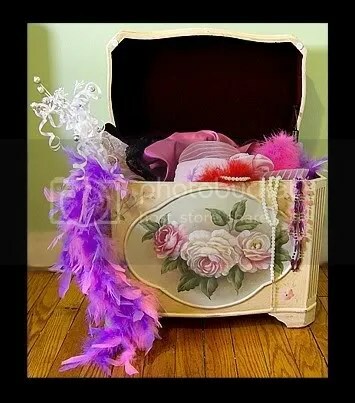 Aside from being so girlish and pretty in its own right, painted all over with pink flowers and femininity, it came stuffed to bursting with everything from tutus to tiaras – including sparkly jewelry, fabulous hats, magic wands, feather boas, a myriad of purses, all manner of things sequined, shiny, and gauzy. . . you name it, its in there. A veritable treasure chest for little ladies, and being the pretty pirate that she is, Puff does call it her treasure chest! She adores it – and her love will only grow as she does. Little girls and dress-up – it’s just one of those things! A happy Christmas was had by all. . . even our grumpy old dog got into the spirit of things! What a wonderful time! The cookies are to die for. I’m thinking I may have to make them next year at Christmas time too. Wow! What a great Christmas Miss T had! (Mommy and Daddy, too). I love the “treasure chest.” Julia also got a dress up box, but not nearly as fancy….instead of a beautiful flower chest, she got a cardboard-ish chest, lol. And the clothes arent’ nearly as cute as they looked in the picture! I’d say she got everything she wanted and then some! Sounds like you had a WONDERFUL Christmas and I am so glad!! I love the kitchen and all the “yummy” food! 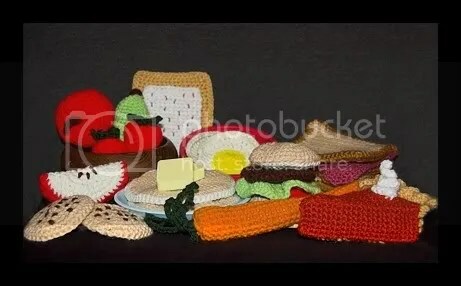 and the crocheted foods!! FAB, FAB, FAB!! she could sell those! I love your homemade gifts and yes, they do look store bought! I am going to have to try some of your ideas for next year! Did you see my birdseed biscuits post? My kids loved it and I thought of you and little Puff! Wow!!! I love the kitchen set and the pretend food set comes with it. Nonna is awesome! She did such a wonderful job making those crocheted set!! She could certainly start a new small business with this. 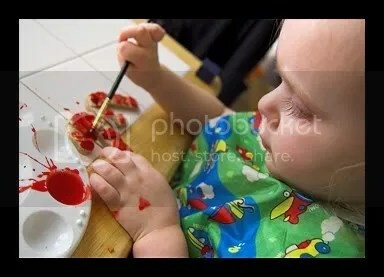 Seems your family is very talented! 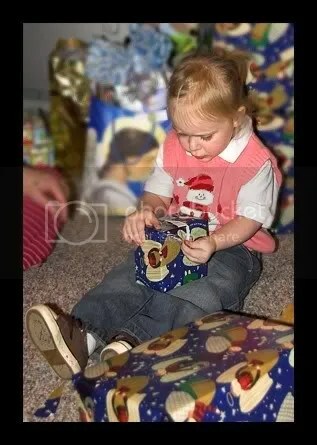 Glad that Tball has got such loving family and they made her Christmas a best one!! God bless u all!! Glad you see you again in the bloggy world!! I’m sure Christmas at your house was a wonderful time. I love all the pics…my faves-kitchen set, fluffy food, Puff in a hat. Of course all are fabulous. Take care of yourself and tiny baby!!! 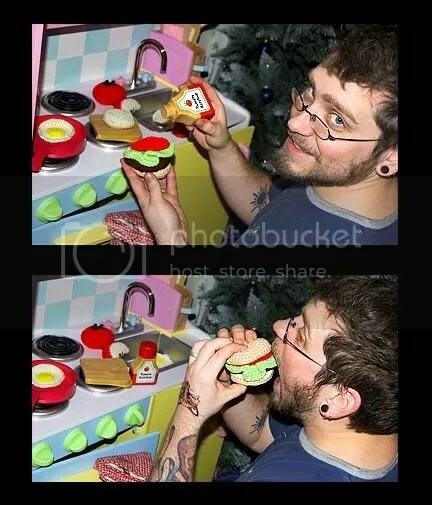 What an entertaining buffet of Christmas photos! I must admit, I just loooove the one of Teaball just about to drink a cup of tea – lips pursed and eyes wide – oh, that is just such a GOOD picture. The pics of the lovely Teaball in her blue gown really show how long her hair has gotten. What great gift baskets you made! I like that bath salt idea. 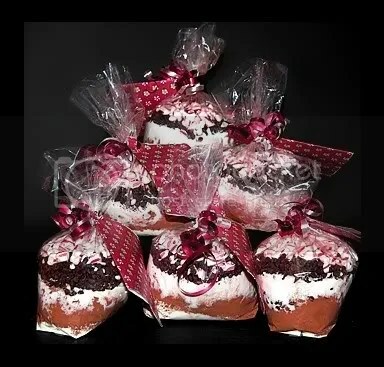 Very pretty, those baskets took you a lot of time to make, I hope all the recipients loved them! Okay, FooFoo IS a little shocked over here, almost fell out of her chair (not really, but almost), but is T in… pink? What’s going on here. Did the holidays toss T’s wardrobe into festive giddiness? What a good idea to buy hammer and peg sets. I should get one for my son! Excellent thinking. How neat to read all about your Christmas. But I must ask . . . I’m missing T’s mother in the pics, where did she go? Wecki – I’m glad that you enjoyed the cookies! I’ll be sure to get you the recipe – don’t let me forget! Christine – Awesome that Julia got a dress-up box! Regardless of how it looks or what its made out of – playing dress-up is the GREATEST! And if Jules is as excited about hers as T is – she’ll have fun with it for years to come! Jenn – We really did have a wonderful holiday, and I’ll be sure to let my mom see what nice things you said about her food! They really are lovely! Let me know if you need any of the recipes for the basket stuff next year. . .and YES! Your birdseed biscuits looked SOOO cool! We have one using a bagel – but not nearly as cool as those. We’ll have to try them! Saumya – Nonna ROCKS! I’ll let her know what sweet words you have said about her. God has blessed us with a wonderful family – no doubt about that! Kelli – Glad to be back, though my computer still sounds like I’m riding a moped Thanks, always, for stopping by! 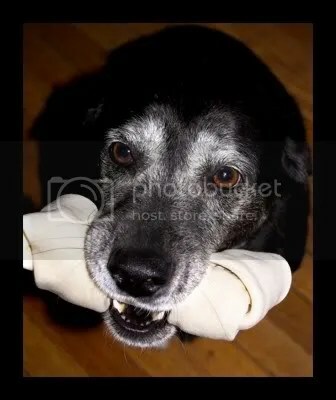 FooFoo – Glad you like the pictures! I almost fell outta MY chair – laughing at your comment! I KNEW someone was gonna pick up on how much pink she was wearing in these shots. We do own pink – I think we have 3 shirts and a feather-boa. . . hand-me-downs, of course. . .Pink in small doses is okay – I’m just not a huge fan of the color, and people go SO overboard with pink and baby girls! The term ‘festive giddiness’ just has me cracking up over here!!! Totally get your little man a pegboard – he will LOVE it! awww I love this post!! 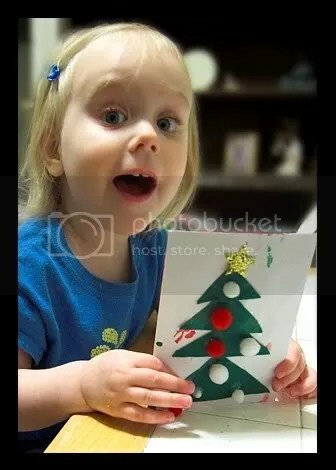 The pictures are perfect, even the Christmas barf cards! They’re perfect!!! I know what I’m doing for Christmas cards next year! This year, cards got cancelled due to life getting in the way. 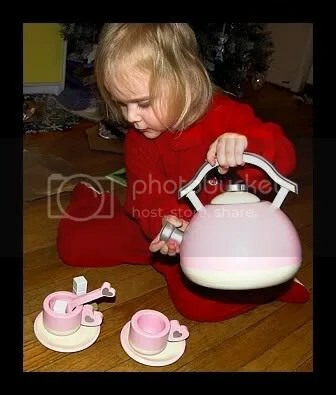 😉 I’m so excited that she’s in love with all of her stuff…I’m SOOOOO glad that she loves her tea set, even if it IS pink and not yellow/green like you wanted. I still think you should paint it.heehee! Can’t wait to see video of LMT! Nonna’s food rocks. I want some! !